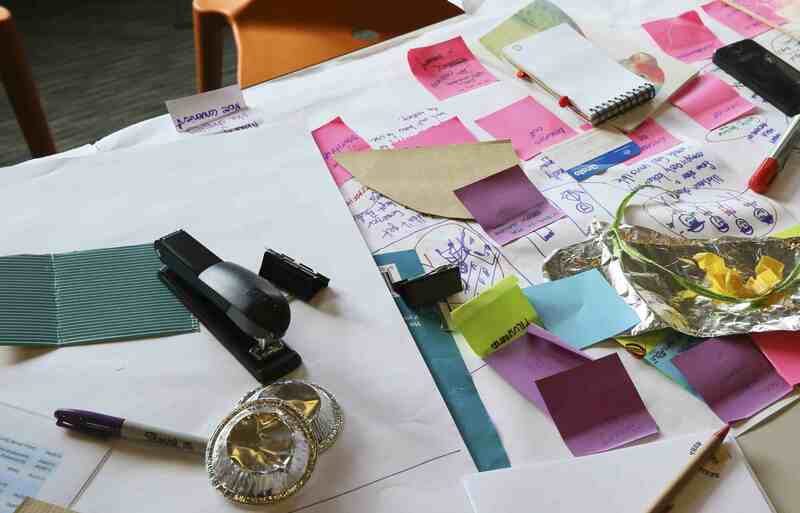 Running a successful co-design workshop requires that you are prepared for the needs of your participants. After our post last week about inclusive co-design methods, we’ve put together some tips on things you can do to prepare for an inclusive co-design workshop. Firstly, ask people about what they may require and do this in a meaningful way. We’ve seen plenty of attendance forms that ask if you have accessibility requirements and provide you with the option of answering ‘yes’ or ‘no’ only. There is no way to stipulate what the requirements might be. Make the effort to have a conversation well before the workshop is scheduled. If you are distributing any printed material ask attendees if they require large print. What size font is suitable? What kind of paper? For example, those with low vision sometimes find white paper causes excessive glare, so we provide buff paper if they require it. Sometimes they will request a particular colour. Do they need a braille version of material? Once we know this, we provide plain, unadorned text versions of any material required for the workshop in advance. This means no bold, no colour, no logos. Plain text is less likely to cause problems with any assistive technology participants might use: screen readers, screen magnifiers etc. Images in this material are provided with alternative text descriptions. Images that are essential for understanding – not only illustrative – are embossed. With help from RIDBC Alternate Format Printing group we have had things like graphs embossed so they can be read by all. Additionally, we often provide Easy English versions of material when working with people with an intellectual disability. Tasks are broken down into clear steps and communicated using Easy English. We ask people with vision impairment how they would like the room set up. Would you like to be in the centre? Do you need additional space? Are you bringing a guide dog? We then consider if there is anything we can do to support their orientation and mobility within the room. When participants with vision impairment arrive we give them an introduction to the space so they are more comfortable moving around within it, this also provides an opportunity to alter the space based on their feedback. We will also discuss when the designated breaks are and ask if they require additional breaks or alternate breaks, to take their service dog outside, for example. You don’t want to put people in the position of being fearful of asking for a break. If people from the Deaf community are attending you may need to arrange Auslan (that’s Australian sign language) interpreters. The physical set up of interpreters (be it Auslan, DeafBlind or community language) within the room should also be considered in advance so you can accommodate the number of people in the room and set up furniture accordingly. This can become critical when DeafBlind participants attend a workshop. At times, DeafBlind individuals may be using an interpreter who themselves is from the Deaf community. This will mean a second interpreter is required, who will sign to the first interpreter who in turn signs for the workshop participant. Given the need for interpreters to have frequent breaks, this may mean an individual participant brings multiple interpreters. All of these individuals need to be meaningfully positioned within the workshop space, not pushed off to the side, or sitting down the back. A co-design workshop with people with disability can often be longer than those with people without access requirements. For example, people with communication disabilities, who use Augmentative and Alternative Communication (AAC) methods such as communication books or boards may need longer to compose replies and responses to workshop questions and activities . Take this into account when planning your schedule, as it is vital these participants are given equal opportunities to have their say and be heard. We’ve only focused on only a few access considerations here, this list is not exhaustive. We hope it can contribute to a broader conversation on co-design workshops and inclusion.